Today's topic for the Fall Fun Series is Halloween decorations. I wish I really could go all out with Halloween decorating, but as I explained in my fall decor post I'm really limited on space. Space to decorate and space to store decorations. I manage best, by keeping my fall decor inside the same and breaking out the Halloween decorations for outside. I live in an apartment, but I live on the third floor. I like to give out candy to Trick or Treaters, but it's hard to convince kids to want to walk up three flights of stairs for candy. I do my best to decorate my balcony to let the kiddos know that I have candy and it's worth the trip up the stairs! The glitter Halloween sign, pumpkins, and owl all came from Dollar Tree. The witch cat wind sock came from Walmart. The purple rope lights and orange light came from Target. The lights are super bright, and our apartment faces the parking lot, so it definitely makes a statement! The Trick or Treat sign came from Target. The "Boo!" sign came from Walmart. My glitter pumpkin and owl came from Big Lots. The pumpkin sign came from Dollar Tree. 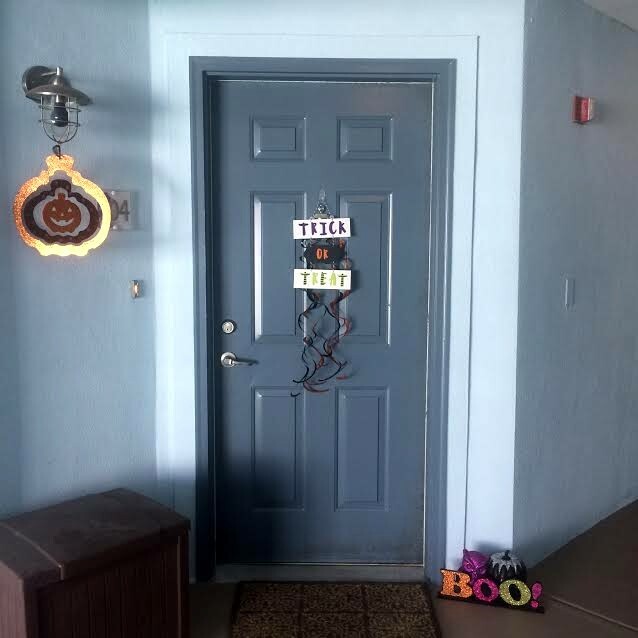 I wish I could do more with my front door with lights and such, but there isn't an electrical outlet out there, and they're pretty strict on how much decoration can go by our front doors. If I had more time, space, and money I'd love to do more. I'd love to decorate inside too, but that's not going to happen right now. I just hope we get trick or treaters this year. In 2013 and 2014 we had tons of kids stop by, but last year we hardly had any. I'm hoping that was because Halloween fell on a Saturday last year and I know people tend to go out if it doesn't fall on a school night. I'm hoping with Halloween on a Monday night this year we'll get trick or treaters! 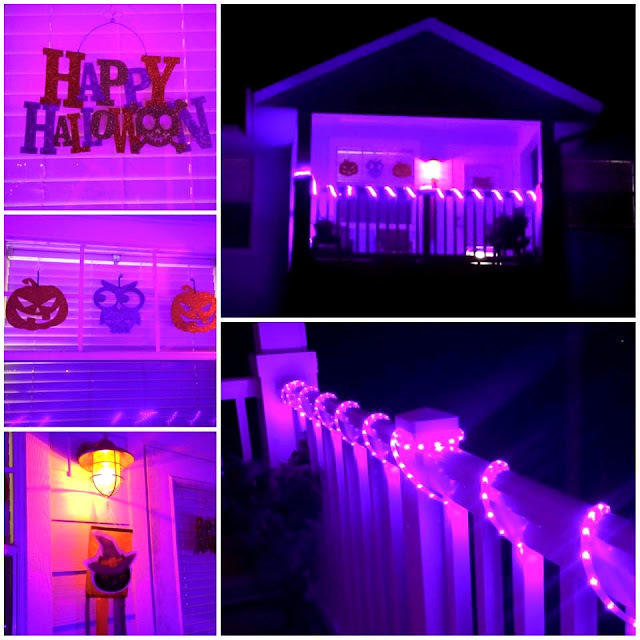 Check out my friends Halloween decorations below!